And cross listed at the Grad Center, Earth and Environmental Science Dept. Discussions around economic democracy and economic “alternatives” often focus on either firm-level changes like cooperative ownership structures, or focus on high-level, abstract conceptual shifts from “capitalism” or “neoliberalism” to some “next system”. Where do system transformation and the transformation of daily life intersect and interact? How do we join the urgent need for institutional redesign and reconstruction to the present day political movements and structures available to us today? 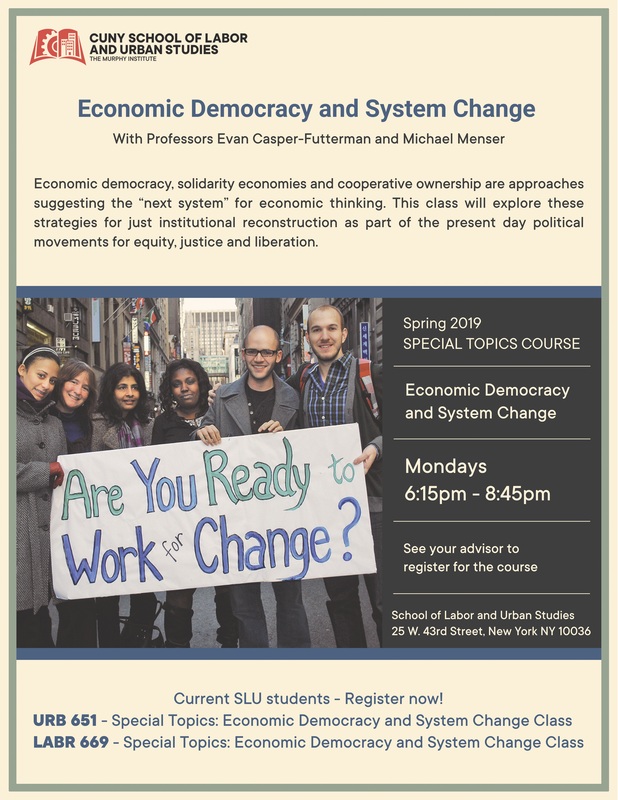 In this class we will look at mechanisms and visions for democratizing the economy, politics, and social life. We will investigate democratic forms of ownership, management, production, and consumption and the institutional and political conditions needed for them to flourish and scale. Perspectives discussed include solidarity economy, community wealth building, P2P, co-city, new municipalism, energy democracy, commons, climate justice. Processes and forms include participatory budgeting, green new deal, cooperatives, platform cooperativism, reparations, community land trusts, federal job guarantee, public bank, green transition. Sectors include healthcare, climate change adaptation, advanced manufacturing, public utilities in energy, water and broadband. Readings will draw from multiple disciplines, and include scholarship, policy, and dispatches from activists and practitioners past and present including Kali Akuno, Sylvia Federici, Sheila Foster, Jessica Gordon-Nembhard, Paul Mason, Nathan Schneider, and many others.